The Triumph 4850-EP offers high speed production and top of the line safety features! The MBM Triumph 4850-EP Paper Cutter offers high speed production and top safety features. This Automatic Programmable Paper Cutter includes an “EP” back gauge control module that features an LED digital display and keypad for programming up to 99 steps each, and an optical cutting line which indicates the exact location off the cut and helps to perfectly position trim marks. The Triumph 4850-EP features a power back gauge and programmable keys which saves time and maximizes efficiency for small quantities and frequent changes. The Triumph 4850-EP features a safety cutting system that is designed to prevent injury during operation. This safety feature included transparent shields on both sides of the blade, automatic clamp return, and disk breaks for immediate cutting cessation. This fully automatic paper cutter can slice through a height of 3 inches and almost 19 inches wide! This would be a great addition to any business cutting large quantities of paper on a regular basis. If you have any questions or are interested in purchasing the Triumph 4850-EP Paper Fully Automatic Programmable Paper Cutter, visit us at SpiralBinding.com. 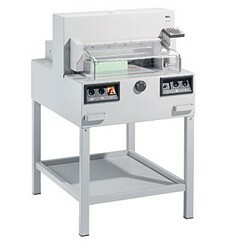 We have great pricing on a full line of Electric Paper Cutters. Call us at 1-800-631-3572 for more information!